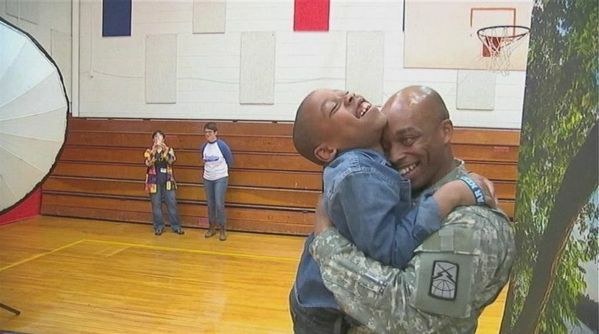 School picture day was also homecoming day for one delighted third-grader in Durham, North Carolina. When 8-year-old Joshua posed for his spring photo at Pearsontown Magnet Elementary, he had no idea that he was standing in front of a highly personalized background. 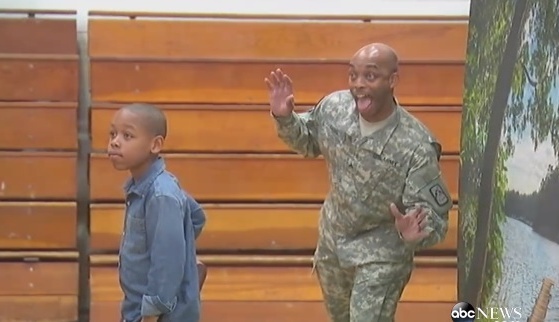 While Joshua smiled for the camera, his dad — Army Corporal James Bass — stepped in behind him for the ultimate photobomb. The photographer showed Joshua how his picture turned out, and the boy was shocked and delighted to discover his father in the shot. The surprised young man turned around, took a moment to process the scene and jumped into his father’s arms. Corporal Bass is home on leave after spending several months serving in Kuwait. Thank you for your service, sir. And thank you, Joshua, for sharing your very special dad with us. Here’s wishing the Bass family a happy, happy reunion!